With Easter coming up I shall have a houseful of people to feed. 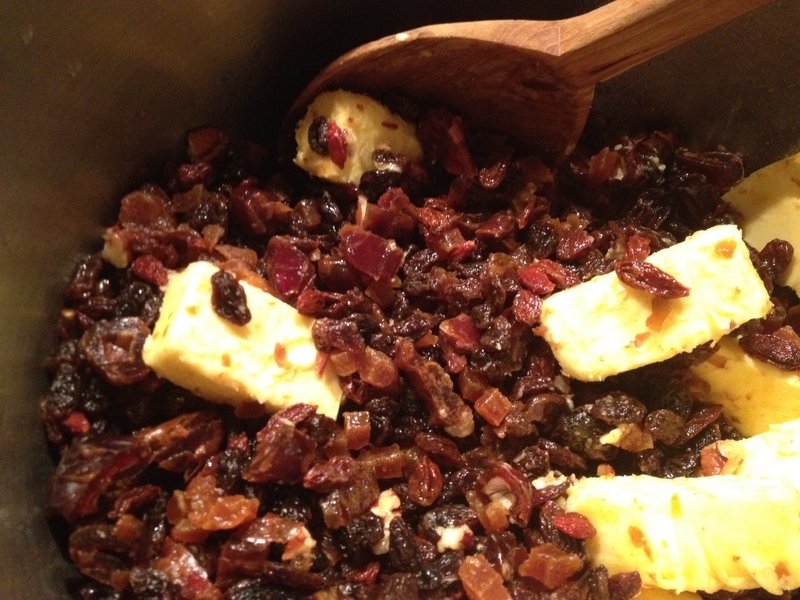 My easy Boiled Fruitcake is a wonderful treat to serve with a cup of tea, or heated as a dessert with fresh cream, custard or ice-cream. Even non-cooks can make this cake! Place your mixed fruit into a large saucepan. (For this cake in the picture I used 200g of dried peaches finely chopped, 100g of goji berries, 400g of dates and 500g of sultanas and a handful of chopped pecans as that was the fruit I had to hand. The gojis, dates and peaches were very dry so the extra water was needed!) Add the chopped butter, water and Bicarb Soda and bring to the boil, stirring often so nothing sticks to the bottom. When it has begun to boil turn off the heat and let the mixture cool. This takes a few hours and plumps up all the fruit beautifully. After cooling it should look like this, with nice juicy fruit pieces. While the oven is heating, add your condensed milk, vinegar, alcohol and vanilla, stirring well. Just mix it straight into the big saucepan. That way you only have one pot to wash up! The mixture will foam a little – don’t panic, this is normal. Then sift your flour, baking powder and spices into the mixture and stir through until combined. Taste the raw batter and adjust spices if necessary. You mixture will be thick and you’ll need a strong arm. Spoon the mixture into the tin or tins. Wet your hand and then press down lightly on the mixture to smooth it out and make the tin evenly filled, ensuring the mix is pressed in well into the corners. 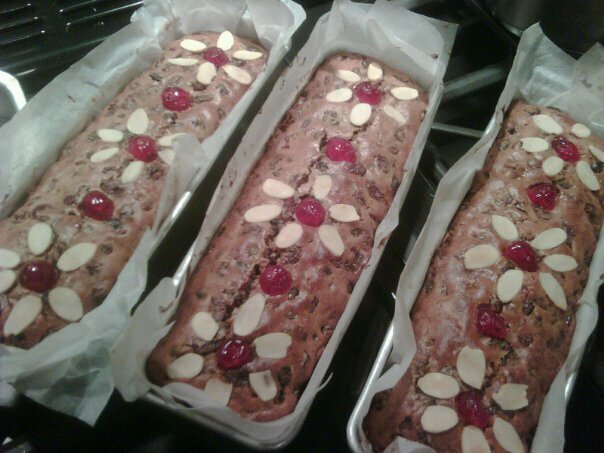 You may then decorate the top with almonds or cherries if you wish. Place in the oven and follow the baking times below, using a skewer to test of the cake is done about ten minutes before the time is up. If it comes out clean the cake is ready, if mixture still adheres to the skewer bake a little longer. 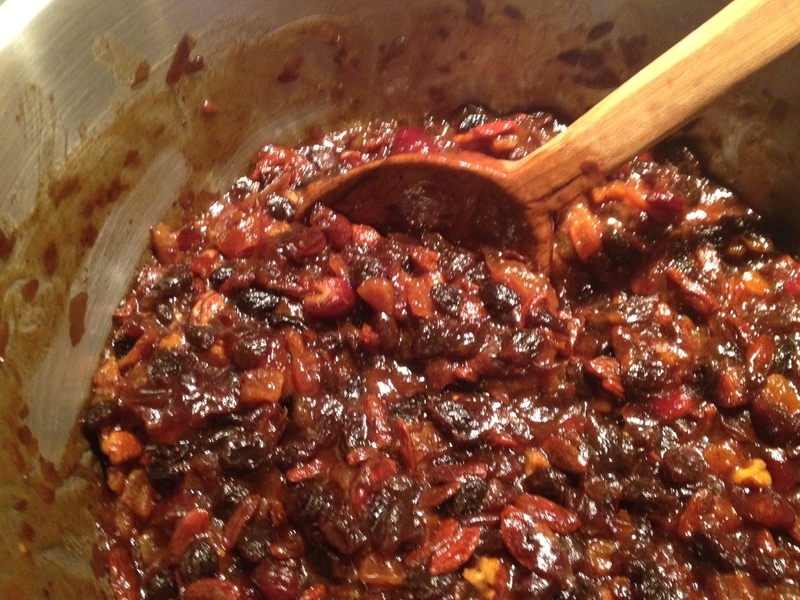 When you pull the cakes from the oven pour a capful of extra rum or brandy over the top while the cake is still warm. Then leave them to cool in their tins before removing. This entry was posted in Cakes and desserts, Life and tagged baking, beginner cooking, boiled fruit cake recipe, cake without egg, condensed milk fruit cake, cooking, easy baking, easy cake recipe, Easy Christmas Cake, easy fruit cake, egg free baking, eggless fruit cake, farmhouse baking, gluten-free fruit cake, gluten-free recipe, home baking, vacation by Cauldrons and Cupcakes. Bookmark the permalink. It looks more than perfect!!! May I consider that an invitation? I will book the first flight!!! Wow! That looks amazing! Way to bring back a classic!!!!!! Looks so pretty too. I would be totally tempted to souse the suckers in rum until it was dangerous! Yeah, too much rum and it gets super soggy – but pouring it on while it’s still hot does the trick. Super delish! That sounds heavenly, I love a boiled fruit cake. I especially like the beautiful decorations you’ve made on top, it’s so pretty and would make a wonderful gift, as you say. Not that I’m against alcohol in any way but I would love to try it with tea in it – any excuse to consume more tea! And of course I would have a nice thick slice of it with a cup of tea (while the cake was still warm….yum!). Love it. 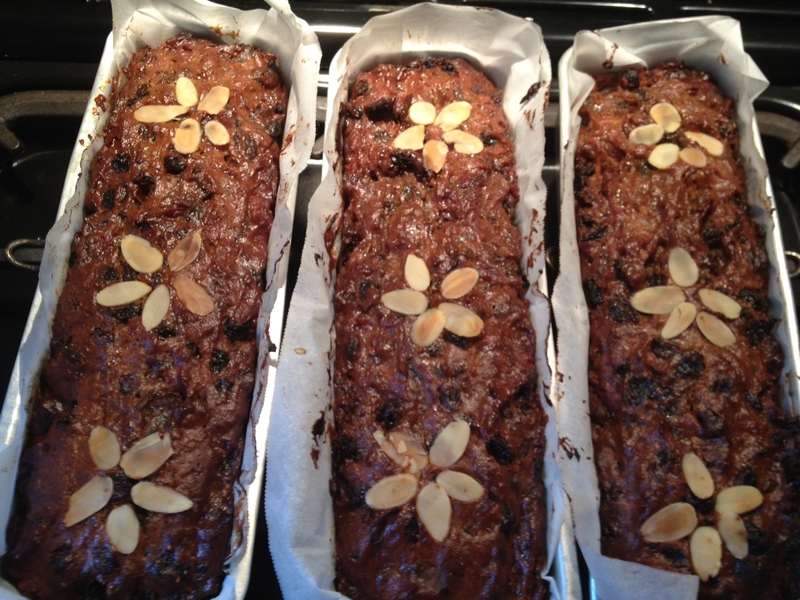 Finally a fruitcake recipe that looks wonderful (and not soggy and funky). Love the almond “flowers” on top! 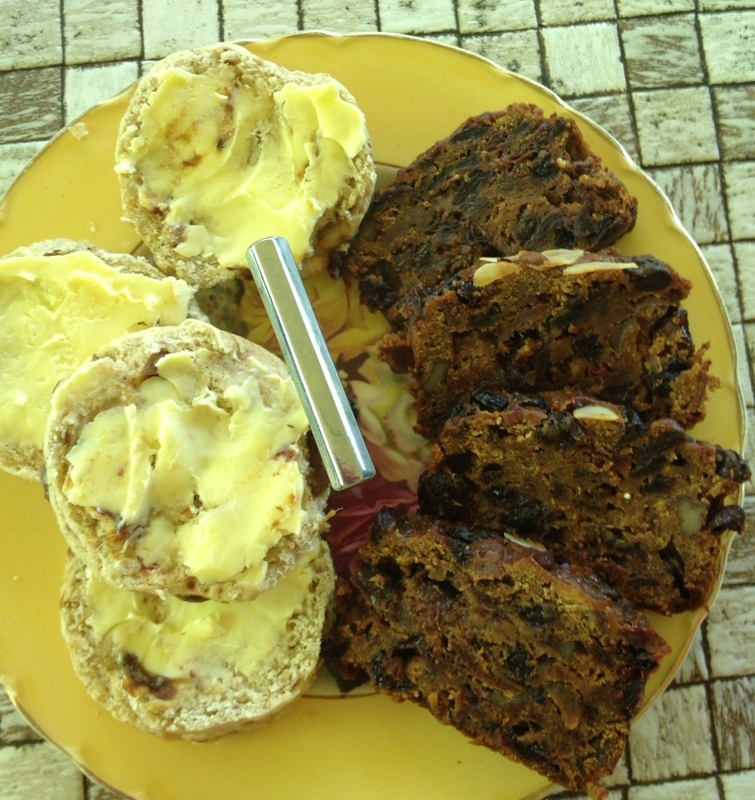 OMG…I didn’t get to see the pics yesterday…but I bought one of these fruit cakes at the recent CWA cake stall…and served it at a Tea Party the other day…it was delicious indeed…very! Where do you buy tins this shallow and long? Yay Satisha! I’m so glad you enjoyed my cakes, and that money will go to such worthy rural causes. I have had these tins for years and years, and bought them at a catering supply shop back when I had a catering business. I have seen them in specialty kitchen shops though. I use them a lot for almond bread too. They are the perfect size for that. p.s I also made some cakes for the recent CWA cake stall…my first offerings! Soaking the fruit mixture now – planning on making 3 smallish cakes, one for my 95 year old neighbour’s birthday next weekend, another for my sweet 30 something neighbour who has just had her birthday, the third one as an Easter treat for 3 hungry teenagers who are coming to stay on our farm down the coast in a couple of weeks. Thinking cap on for creative decorations… Thanks for the cold tea idea also. As this recipe has no eggs and only a little baking powder & bicarb, am I right in thinking it won’t rise much and make a pretty dense cake that holds together without falling apart? Just wondering how full do you need to fill the tin before baking? I was thinking this recipe would make cute individual cupcake size Christmas cakes? I have made these as cupcakes and they turned out beautifully. Just adjust your cooking time. Pop them in for 30 minutes and then keep an eye on them, testing them for doneness as they start to look ready. Merry Christmas! And I filled the papers to 3/4s full. Hope that helps.